Subject lines are the most written about email marketing element—and they’re the most misunderstood as well. The internet is full of bad subject line advice that gets endlessly echoed until it has the ring of truth to it. 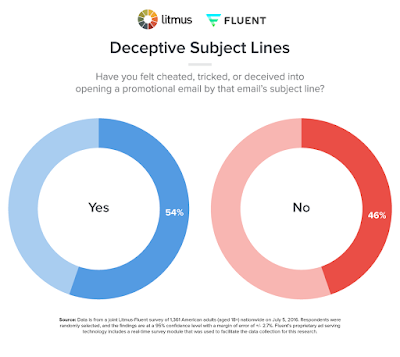 MYTH #1: SUBJECT LINES HAVE THE BIGGEST IMPACT ON WHETHER A SUBSCRIBER OPENS AN EMAIL. MYTH #2: SUBJECT LINES CAN ONLY IMPACT EMAIL OPEN RATES. Don’t believe this? Run a subject line A/B test and track the results through to conversions (or as far as you can). When the email content and landing page content are kept the same and only the subject line is changed, you’ll see that the subject line absolutely affects post-open metrics like clicks and conversions. This is because the subject line sets expectations about what the subscriber will find when they open the email. Set the right expectations and the subscriber is more likely to take additional steps down the funnel for that message. Set the wrong ones—or just don’t set any—and they are less likely to progress. 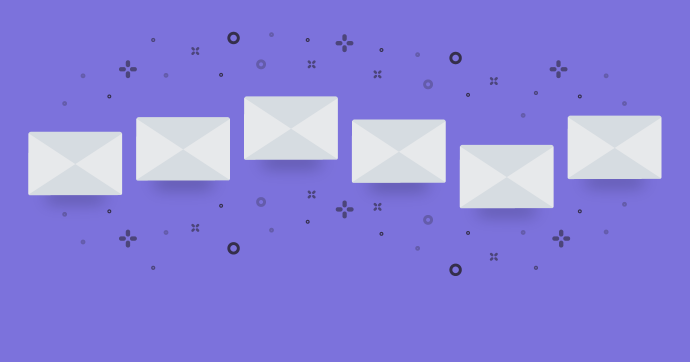 MYTH #3: THE SUBJECT LINE’S ONE AND ONLY GOAL IS TO GET SUBSCRIBERS TO OPEN THE EMAIL. Audience selection is a key tenant of digital marketing. You want the right people to click your search engine marketing ads. You want the right people to click your ads on Facebook. And you want the right people to click the call-to-action (CTA) in your emails and convert on your landing pages. However, you can’t have the right people clicking your email’s CTA if you didn’t get the right people to open your email in the first place. Your subject line should entice the people who are most likely to click and convert for that particular email message. This is one of the biggest reasons that open rates are a poor way to measure subject line success. MYTH #4: TO COMPEL SUBSCRIBERS TO OPEN, SUBJECT LINES NEED TO GRAB THEIR ATTENTION WITH PROVOCATIVE AND INTRIGUING LANGUAGE. Creativity definitely has its place in subject line writing, but it’s the exception rather than the rule for most brands. Most of the time, well-branded and straightforward subject lines win. That’s what a MailChimp study of 40 million emails found. They concluded that the secret formula for subject lines is: “Your subject line should describe the subject of your email.” We agree. MYTH #5: THE WORST THING THAT CAN HAPPEN TO AN EMAIL IS THAT IT ISN’T OPENED. If you pursue an open at all cost, you just might get it…along with a serious case of “opener’s remorse.” The majority of consumers report having felt opener’s remorse, according to a joint Litmus-Fluent consumer survey. So getting the subscriber to open an email that was irrelevant to them could cost you future opens, clicks, and conversions by causing the subscriber to ignore subsequent emails, could cost you the ability to reach them via email if they opt-out or complain, and could cause you brand damage if your tactics generate negative social media buzz or word of mouth. While email conversions should be primary goal of your emails, the secondary goal should be to maintain your relationship and keep the email channel open as way to communication with customers and prospects. 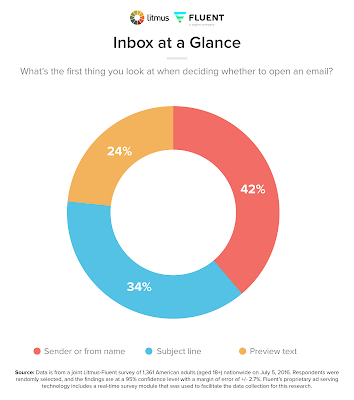 MYTH #6: IF AN EMAIL ISN’T OPENED, THEN IT’S LIKE YOU NEVER SENT IT. Sometimes we let what we can easily measure define our reality. Opens is one of those cases. Many people have a Boolean mindset when thinking about emails: The subscriber either opened the email or they ignored it. The email succeeded or it failed. 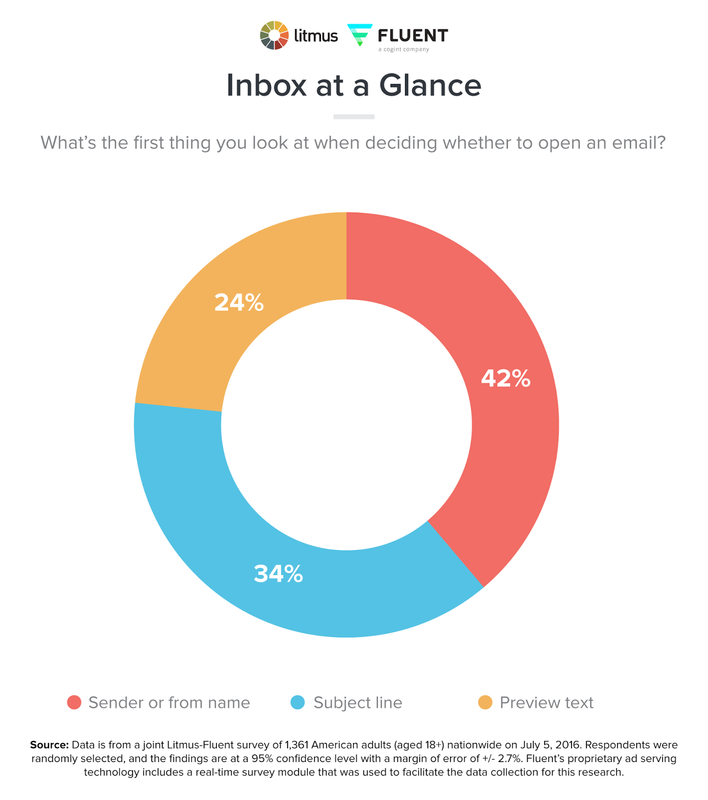 In some ways, it would be nice if measuring email marketing success were that easy. Attribution modeling could certainly be a lot less of a nightmare. However, that black-or-white sense of reality is far from the truth. First, from a technical point of view, we know that a significant percentage of subscribers still block images by default. So in those cases, an email can be read without an open being recorded. And second, even though we like to think that subscriber behavior is linear, it’s often not. Subject lines often lead to actions that don’t include opens. More than one-third of consumers say they’ve visited a store or website as the result of receiving but not opening an email from a brand, according to a joint Litmus-Fluent consumer survey. 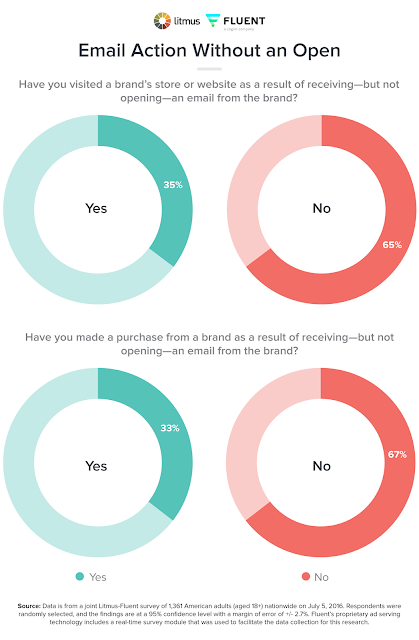 And roughly the same percentage say they’ve made a purchase from a brand after receiving but not opening an email from them. It’s quite easy to imagine this happening with an email from your bank that has the subject line “Your Statement Is Now Available” or an email from your favorite retailer that has the subject line “40% off in store this weekend.” With the former you might just open your web browser or mobile app and log into your account, and with the latter you might simply head to the retailer’s local store on Saturday. But, of course, if you write a mysterious and evasive subject lines, then the chance of an openless engagement all but disappears. The best way to accomplish that is by writing clear, straightforward, and detailed subject lines and preview text; and focusing on deep metrics and subscriber-centric metrics.